Moving Windows to new hardware can introduce problems, many of which can be addressed at the source before the migration. The single most likely problem for Windows after a migration is incompatibility of the hardware device drivers. Windows 10 has proven to be less problematic than previous versions when moved to different hardware. If your Boot Camp system fails to start up after a migration, return to the Source Boot Camp system and apply these tips. With the exception of the first item, these are optional and not required unless a migrated system fails to boot. Contact support@twocanoes.com with questions or if you need assistance. Make a Winclone image before taking action – This applies globally for any situation where a major change will occur in Windows, whether migrating, installing software or major Windows upgrades. A Winclone backup made before the major change will help ensure that the system can be snapped back to the exact state it was in before the modification was made. Uninstall Anti-virus and disk imaging tools – After a migration, Windows will attempt to run a disk check on the system before it starts up. Anti-virus programs can often disrupt the disk check, leaving Windows unable to proceed with startup. Uninstalling before cloning and migrating can help avoid this issue. Make sure to reinstall any uninstalled programs again after the migration is complete. Disable all third-party startup items – Like anti-virus programs, other third-party programs and processes can disrupt the disk check task and leave Windows in a hanging state at first startup on the migrated system. Temporarily disable startup items. In Start-> Run enter “msconfig” and in theSystem Configuration window select the Startup tab and disable all of the items in the list. After the migration is completed, return to System Configuration and re-enable the startup items. Run Sysprep – Sysprep is a tool built into all versions of Windows and serves to remove device drivers, among other things. When run using default settings, Sysprep is a blunt instrument. Sysprep removes all device drivers, sets the system to a first-run state and removes Windows license authorization. Often a last resort when migrated systems fail to boot or crash during startup, Sysprep can provide a way to boot Windows when other steps have failed. After the migration, it will be necessary to re-install Boot Camp drivers and reauthorize Windows, so be prepared for this before using it. See more information about using Sysprep below. IMPORTANT: To protect against potential data loss, always create a Winclone image of Boot Camp before running Sysprep. 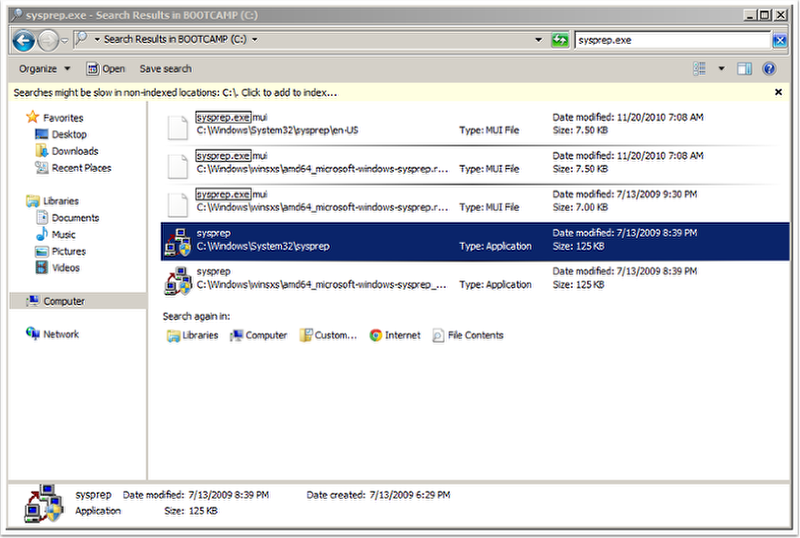 Open Windows Explorer on Computer (C:) and enter “sysprep.exe” into the search field at the top right to locate the Sysprep application. You may also navigate to C:\Windows\System32\sysprep. 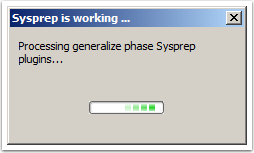 Double-click on Sysprep to start the program. The example below is from a Windows 7 system but should appear similar on Windows 8 or Windows 10. The options for running Sysprep are very simple. Select the “Enter System Out-of-Box Experience (OOBE) and make sure to check the Generalize checkbox. Generalize is what removes the device drivers from Windows, so it’s very important to ensure that this box is checked before continuing. In Shutdown Options, select Shutdown. Do not select Reboot. Sysprep will begin removing driver registrations and generalizing the operating system. The display may flicker occasionally as display drivers are removed. 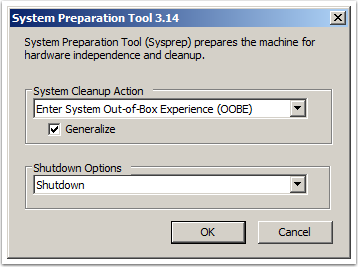 Once Sysprep is complete, Windows will shut down.Do not restart into Windows. Restart into OS X.